Adhering hydrogels to various materials is fundamental to a large array of established and emerging applications. The last few years have seen transformative advances in achieving strong hydrogel adhesion, which is a supramolecular phenomenon. Two adherends connect through covalent bonds, noncovalent complexes, polymer chains, polymer networks, or nanoparticles. Separating the adherends dissipates energy through cascading events across length scales, including bond cleavage, chain retraction, and bulk hysteresis. 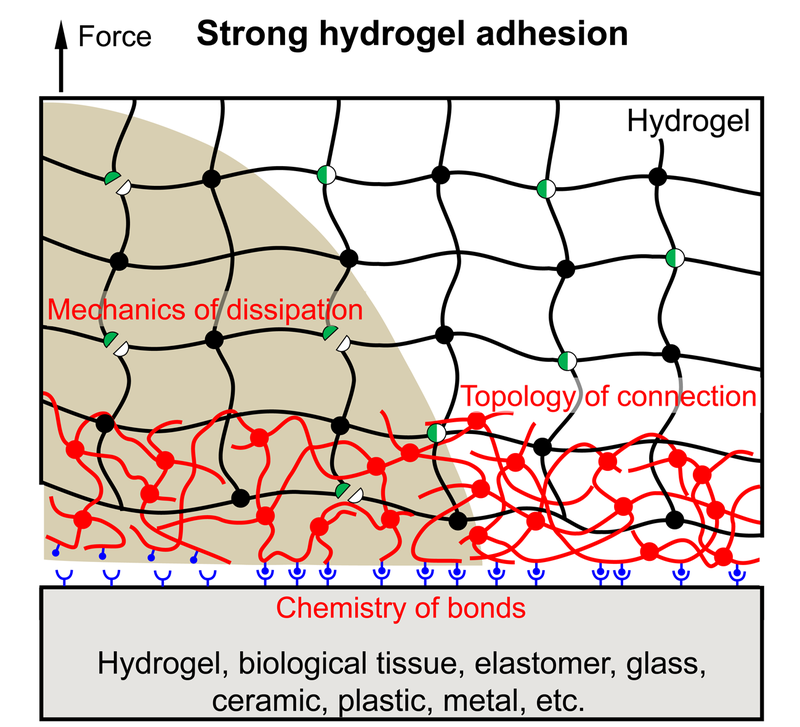 A unifying principle has emerged: strong hydrogel adhesion requires the synergy of chemistry of bonds, topology of connection, and mechanics of dissipation. This synergy characterizes hydrogel adhesion to various materials (another hydrogel, tissue, elastomer, plastic, metal, glass, and ceramic) in various operations (cast, coat, print, attach, pierce, and glue). Strong adhesion can be made permanent, reversible, degradable, or on‐demand detachable. The development of hydrogel adhesion and its applications adheres disciplines, discovers interlinks, and forges cohesion. Discussed throughout the review are immediate opportunities for fundamental studies and practical applications.